I can’t believe I haven’t posted about this cake yet. 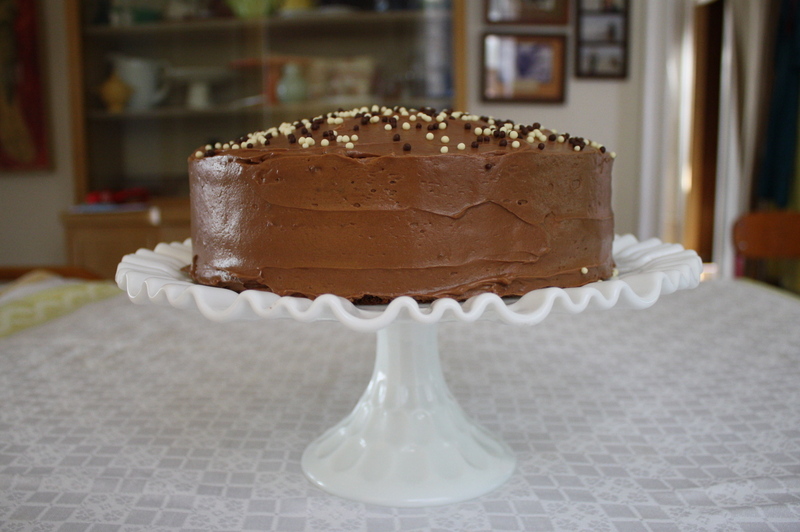 I have made this cake more than any other…well, besides the old family stand-by. 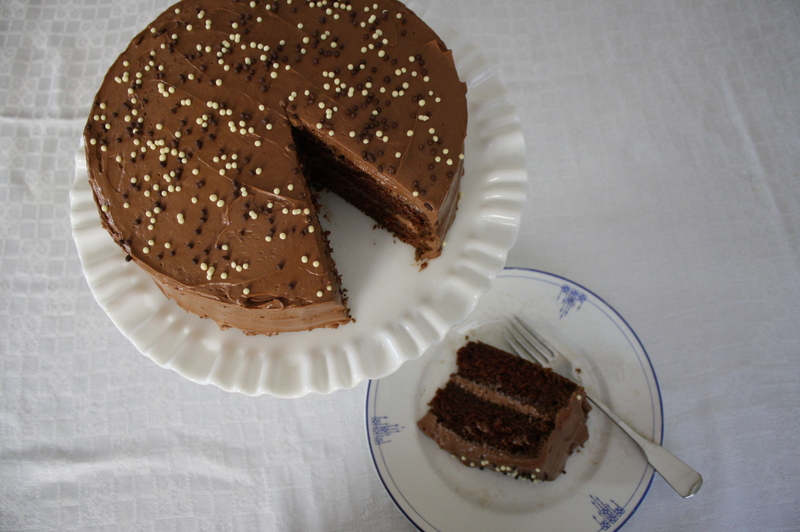 But this cake is SO GOOD. It has a really nice cocoa flavor, not super deep-rich chocolate, so it’s great for all palates. And the frosting is so fluffy and buttery, it just melts in your mouth. 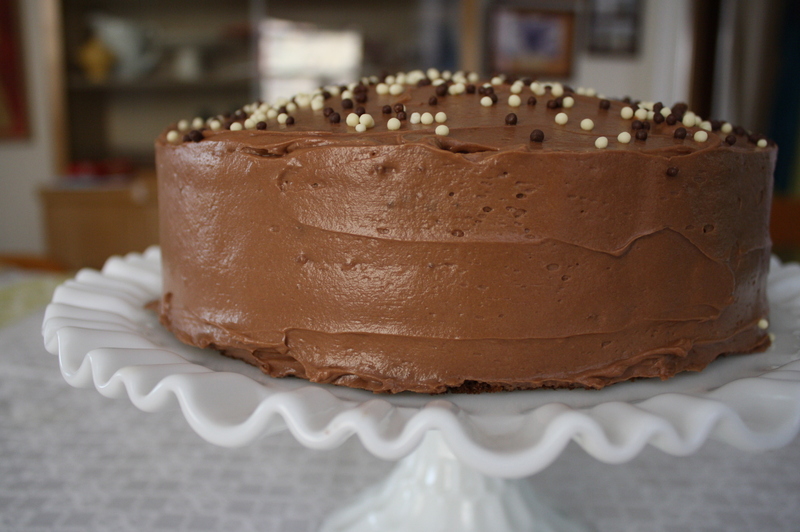 I’ve made this cake for numerous birthdays, get-togethers, and just because we want cake. It’s not super difficult, as far as cake recipes go. 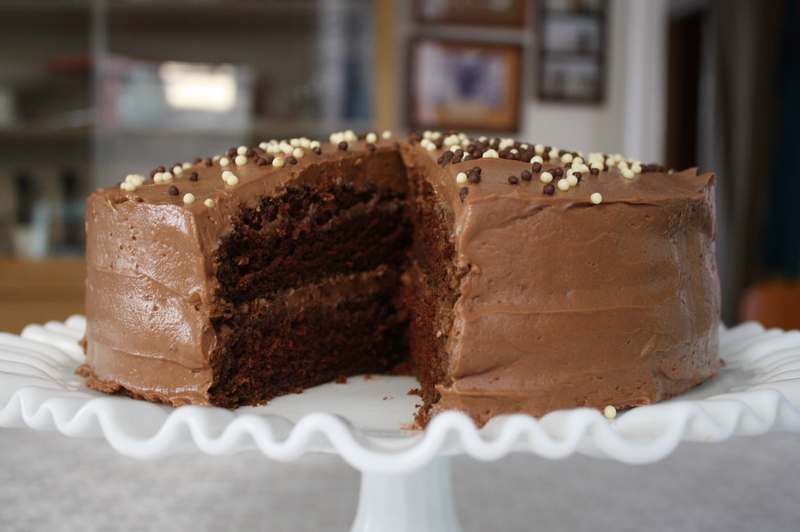 If you’re looking for a good, old-fashioned, super moist and chocolatey cake recipe, this is IT. My mom gave me the recipe several years ago, in an article cut out of her local newspaper. It was literally called the “World’s Best Chocolate Cake” (I did not give it this ridiculous name). I don’t remember the specifics of the article…someone won a cake contest, or a cake connoisseur happened upon it at a dinner at a friend’s, or something along those lines. I tried to find the original article, to no avail, so I can’t tell you the real story. All I can remember is that the writer thought this cake was the best he had ever had, and I had to see for myself. It’s pretty darn good. There’s a few things that I’ve learned after making this cake numerous times. For one, and this goes for most cakes I make, when sifting the dry ingredients, I use the following method: I cut two pieces of waxed paper, and set them side by side on the counter. 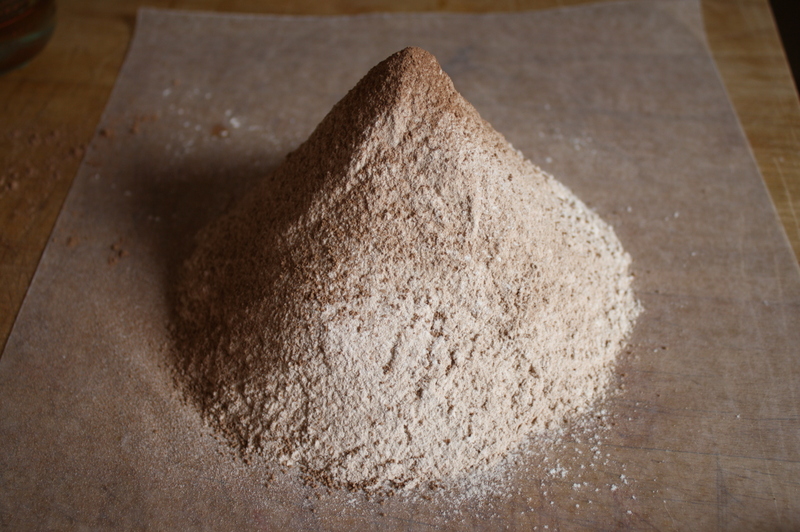 I first sift the flour onto the first piece of paper, then put the sifter on the other paper and measure out the flour, putting it back into the sifter. Then I place the rest of the dry ingredients in the sifter with the flour and sift them all together onto the second piece of waxed paper. Then I just set that aside until I need to add it to the batter. It’s pretty easy to add it, just carefully picking up the paper at each edge, creating kind of a funnel, and slowly pour it into the mixer. 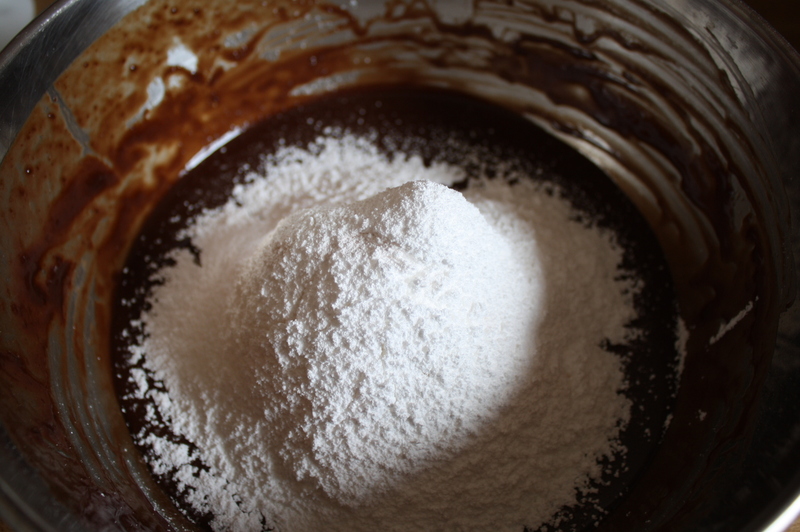 Save your waxed paper for later…you can use one to sift your powdered sugar onto, and the other for my trick below. Secondly, don’t be alarmed when the batter looks curdled after you add the water and vanilla. It will smooth back out after the addition of flour and buttermilk. No worries. Third. 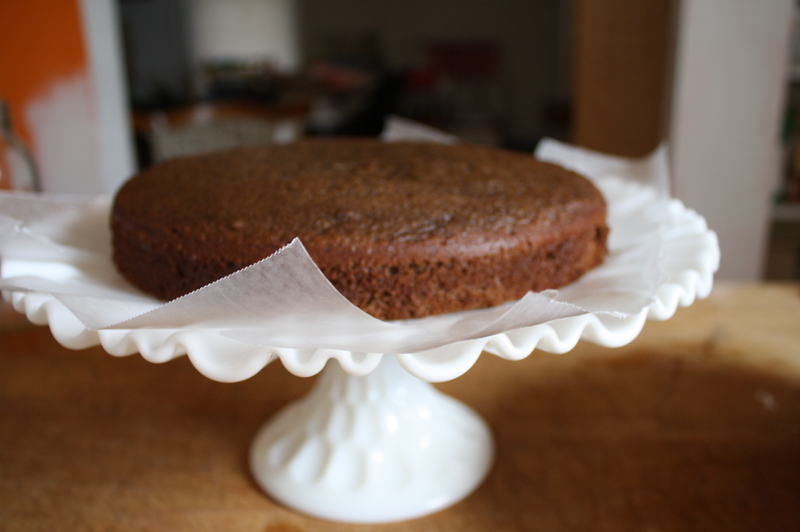 When preparing to frost the cake, cut up one of the pieces of waxed paper and slide them under the first layer. It takes four strips, make sure the plate is completely covered. Then when you’re frosting the cake, the frosting isn’t getting on your serving plate. 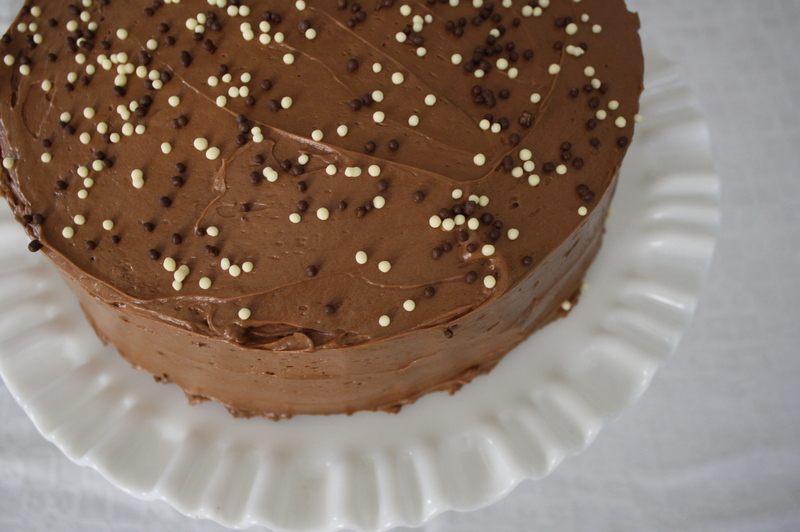 When you’re done frosting, carefully slide the strips out from under the cake and voila! Clean plate. Have all your ingredients at room temperature. Line two 9″ round cake pans with parchment paper and spray with baking spray with flour (or butter and flour the pans). Preheat oven to 350 degrees. Sift together flour, baking soda, baking powder, cocoa and salt, and set aside. 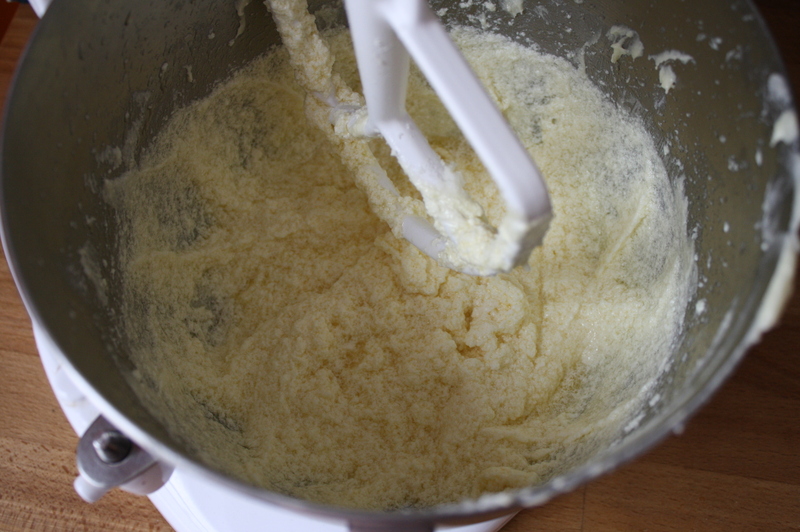 Cream the butter in a bowl with an electric mixer (or use a stand mixer-my recommendation). Gradually add the sugar, and beat at medium speed for one minute, until pale and fluffy. Add the eggs, one at a time, beating for one minute after each egg. Gradually add the water and vanilla on low speed, and then beat on medium for one minute more. 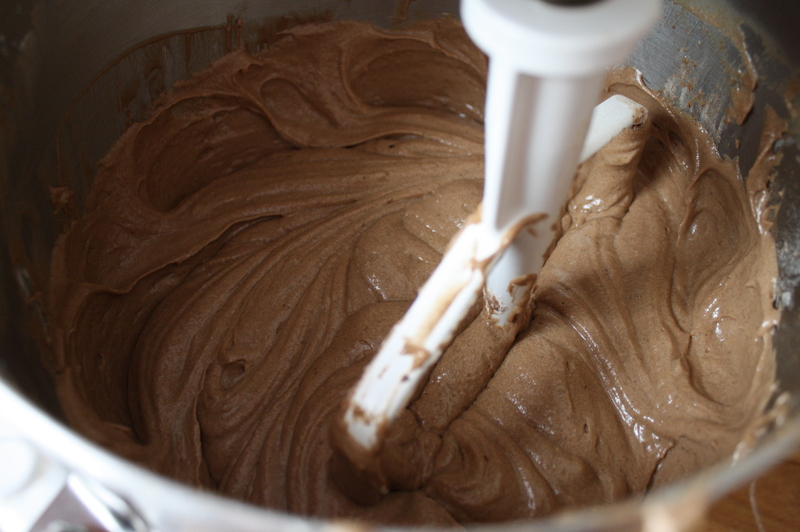 With the mixer on low speed, add one third of the flour mixture, and beat on low until completely combined. Scrape down the sides of the bowl. Add half of the buttermilk, beat on low, scrape down the sides of the bowl, and then beat on low until completely combined again. Alternate the flour and buttermilk in this fashion, ending with the last third of flour mixture. Pour into pans, and bake for 25-30 minutes, until a toothpick inserted comes out clean. Cool on racks for 10 minutes, then remove from the pans and cool on rack until completely cooled. Combine chocolate chips, whipping cream and butter in double boiler over barely simmering water, stirring constantly until smooth (I use a large mixing bowl set on top of a medium saucepan…less to clean up). Remove from heat and add powdered sugar. 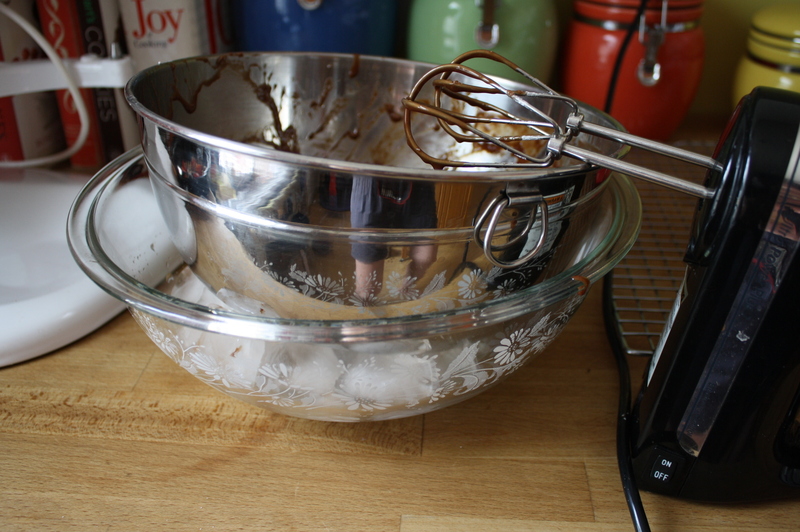 Set the bowl in a larger bowl filled with ice, and using an electric hand mixer, beat on high speed until the frosting holds its shape, about 10 minutes. 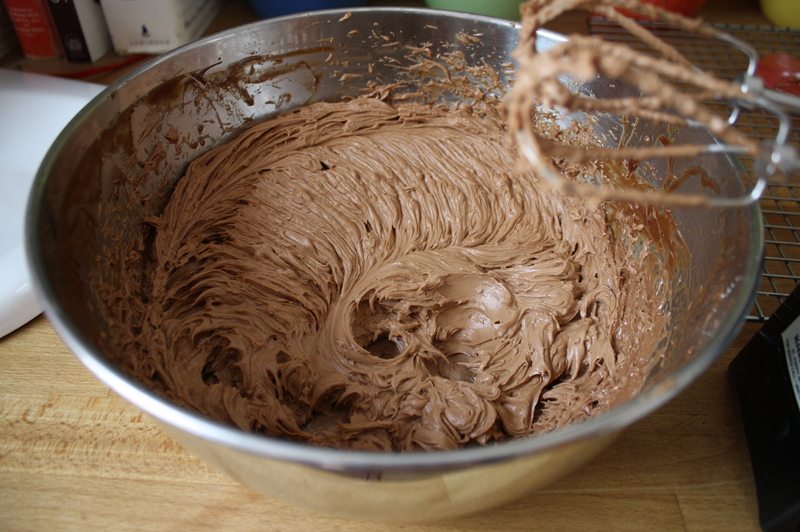 Make sure you take it out of the bowl of ice immediately, so that the bottom of the frosting doesn’t freeze. 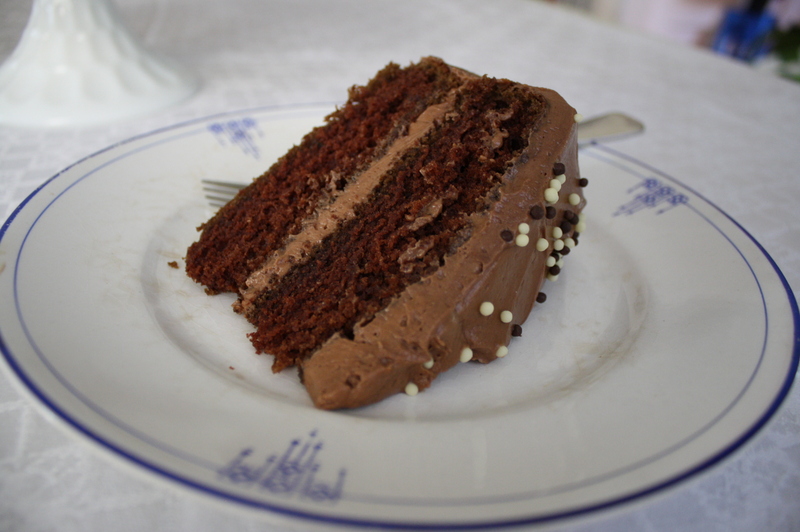 Do you really prefer this cake over the Guinness Chocolate Cake ? They’re so different it’s hard to say. But I think yes, just because I’m really a fan of good, old-fashioned fluffy and moist layer cakes. I’ll try not to seem disdainful. Really!? That’s great…I don’t remember her doing that, but it must have been buried back in the archives of my brain somewhere because I’ve always done it that way. This recipe actually doesn’t call for sifting, either, which I think is totally weird for cake!! You have to sift!! !